On the morning of Oct. 1, 2018 Johnny “John” Schwartzenberger, age 90, of Miles City passed away peacefully of natural causes with his daughter Kathy by his side. 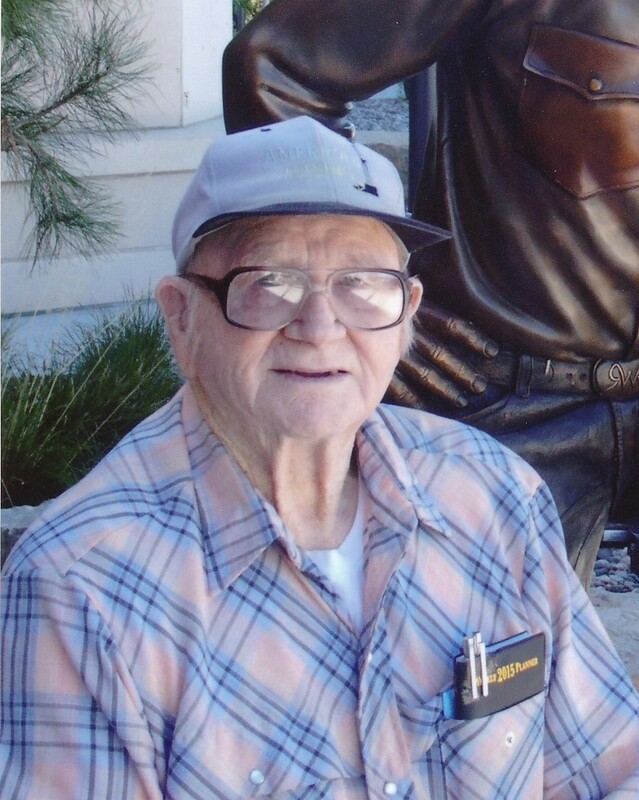 John was a resident of Friendship Villa in Miles City, MT which he grew to love and considered extended family. John was born September 13, 1928 to parents Carl and Katherine (Betsch) Schwartzenberger. John was born in his family home in Midway, MT, which was located midway between Savage, MT and Sidney, MT. John’s younger years were filled with work. He attended school until approximately 5th grade when he quit school to work in his folk’s pool hall in the basement of the Mint Café in Sidney, MT selling candy & gum. Building and inventing things were in John’s blood, when serving in the Korean War John built airplane runways. He was also known as quite a jokester and could get into a little mischief. So along with the honorable work of building runways came the occasional latrine and KP duty. Upon returning from Korea he met and married the love of his life Mae (O’Brien) on January 29th 1955. Their union resulted in the birth of three daughters, Kathy, Sharon and Teresa. John and Mae were also foster parents taking in numerous children who led to the adoption of their two sons Eddy & Ricky. During John’s early years of marriage he worked road construction in western Montana for Jay RaLonde until a severe injury caused him to return to Sidney and his family. Pacific Hide & Fur hired John where he continued to work for 33 years until his retirement. His coworkers remained his loyal friend’s, George would pick him up in the semi and way they’d go for the day. On Dec. 8, 2009, John lost the love of his life Mae after being together for 54 years. Shortly after Mae’s death, John came to live with his daughter Kathy and son-in-law Cody eventually settling in Miles City, MT. Some of his passions were reading old westerns, walking for miles and collecting 5 gallon buckets of rocks, fixing fence, inventing useful and not so useful gadgets, welding, hunting, fishing and reloading shells. A highlight of John’s life was to go hunting and fishing with his good friends George, Don and Kathy. But most importantly to him, his loving Father Jesus Christ and his family and friends. John was honest, loving and hard working as the day was long. He would say if you’re going to do something do it right and that’s what he did he lived right. John is survived by his three daughters; Kathy (Cody) Mavity of Miles City, Sharon (Patrick) Wendt of Sidney, MT and Teresa Schwartzenberger of Miles City; two sons, Edward and Richard Schwartzenberger of Miles City; four grandchildren, Michelle Kutzler of Sidney, Joshua Roberts of Lakewood, WA, Cody Mavity of Savage, MT and Dezerae Schwartzenberger of Great Falls, MT; two great grandchildren, Hayley and Jared Kutzler and two great-great grandchildren, Mason and Tatum. He was preceded in death by his wife Mae, his parents, Carl and Katherine; three brothers, Tom, Matt and Mike; five sisters, Barbara, Frances, Mary, Theresa, Helen and numerous brother & sister in laws and nieces and nephews. So sorry for your family’s and your loss! Just keep the memories alive. Thinking of you! Love and hugs! So sorry to hear about Uncle Johnny. Was so good to see him in August. Had a good visit with him and some laughs. Was good to,see you too Kathy. Take care and give everyone my sympathies. I am so sorry for your loss. You and your family are in my thoughts and prayers. Please dont hesitate to call is you need anything at all. Sorry to hear of John passing. I always remember the time I worked with him at Pacific Hide and Fur when we lived in Sidney. May you always remember the good time that you had with him. RIP.John. I was sad to hear of Johns passing. I had the privilege to care and get to know him while he was living at Friendship Villa, he was a neat fella. So sweet, kind, gentle and caring. My thoughts and prayers go out to his family. We are so sorry to read about your dad’s death. As a friend once told me “It doesn’t matter how sick or old they are, it is still hard to lose a parent”. Hugs to you all at this sad time and know that you are in our thoughts and prayers..